This documentation was created on the 13th of september 2010. The UNECA DSpace might be customized or configured in such way that specific parts of this documentation are not applicable. In its 50 years of existence, UNECA has created and holds a vast quantity of information and Knowledge in a variety of formats, including printed and electronic. These represent the corporate memory, providing historical evidence of its actions and decisions. The information resources include published materials such as flagship publications, journal articles, conference proceedings, technical reports, mission reports, annual reports, working papers, speeches and other grey literature, all which outline important research or decisions that have been made on the economic and social developmental aspects in Africa. The Institutional Repository of the Economic Commission for Africa offers unique knowledge and information not available elsewhere pertaining to regional programmes, decisions and resolutions promoting social and economic development in Africa. To build this Institutional Repository, the Open Source IR platform DSpace was used as a starting point. DSpace captures, distributes and preserves digital content. Hundreds of institutions worldwide use DSpace to enhance online access to scientific articles, working papers, preprints, technical reports, conference papers and data sets in various digital formats. Content grows daily as new communities and collections are added to your DSpace installation. E-Person is the designated term for an authenticated user in DSpace. Prior to this authentication, the physical person needs to register as an E-Person with his name and email address, or this E-Person needs to be created by an administrator. An administrator can manage group-membership for the different E-People. These groups are used to manage rights and roles of these E-People. Browse by Community/Collection takes you through the communities in alphabetical order and allows you to see the sub-communities and collections within each community. The number behind each of the collection and community names indicates the number of items in these collections or communities. Browse by Issue Date allows you to move through a chronological list of all titles of items in DSpace, sorted by the field dc.dated.issued (this date is provided by the submitter during the item submission process). The browse controls allow jumping to a different date point in the index (specified by month and year), switching sort order, and changing the number of displayed results. The “Sort by” dropdown allows you to sort by submit date and title, instead of issue date. Browse by Author allows you to move through an alphabetical list of all authors of items in DSpace. The browse controls allow jumping to different index characters, switching sort order, and changing the number of displayed results. Browse by Title allows you to move through an alphabetical list of all titles of items in DSpace. The browse controls allow jumping to different index characters, switching sort order, and changing the number of displayed results. The “Sort by” dropdown allows you to sort by submit date and title, instead of issue date. Browse by Subjects allows you to move through an alphabetical list of subjects assigned to items in DSpace. The browse controls allow jumping to different index characters, switching sort order, and changing the number of displayed results. 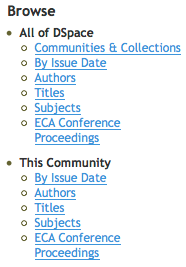 Browse by ECA Conference Proceedings allows you to move through the alphabetical list of ECA Conference Proceedings associated with items in DSpace. The browse controls allow jumping to different index characters, switching sort order, and changing the number of displayed results. Note that the Browse menu on the right offers context sensitive browsing when you are looking at a specific community or collection. 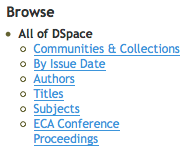 The browse menu that only features “All of DSpace” when you navigate to the homepage of your repository will feature an additional list of options title “This Collection” or “This Community”. To search all of DSpace, use the yellow search box at the bottom of the header. The word(s) you enter in the search box will be searched against all fields of each item's record. will retrieve selects, selector, selection, selecting. The following Boolean operators can be used to combine terms. Note that they must be CAPITALIZED! The advanced search page allows you to specify the fields you wish to search, and to combine these searches with the "contains", "not contains", "equals", and "not equals" conditions. You can restrict your search to a community or a collection by selecting the appropriate community or collection from the Search Scope dropdown. A second selection dialog enables you to restrict your search to items with files, or items without files. The actual search dialog, in which you can enter the search terms, is divided into different rows. Each row allows you to specify a search term related to a specific metadata field. For example, you can search for a specific author name and add a second requirement for a specific word that should appear in the title. You can add and/or remove rows at will. Filtering the category list will remove from the list any terms which do not match the filter. The remaining terms are any category or sub category which contains the filter term anywhere in the hierarchy. Expanding each category will show you which terms (or sub terms) did match the filter. When you access an area of DSpace that requires authorization, the system will require you to log in. All users can register to become subscribers. Some restricted functions, such as content submission, require authorization from the community. As an authenticated user you can edit your profile, logout and manage your submissions through the “My Account” pane on the left. Aside from these options, you will also see “Submit a new item to this collection” links in each of the collections in which you are authorized to submit. Unfinished Submissions are saved submissions that you started at some point, but were not finished and fully submitted yet. Click them to continue the submission process. Submissions being reviewed are your submissions that require attention from an administrator, prior to becoming available in the collection you submitted it to. When starting the submission process for a new item, your first task will be to choose the destination collection. Although you can only select one designated collection, you can contact an administrator to map your submission to additional collections, so that it appears in multiple collections. Click on the arrow at the right of the drop-down box to see a list of Collections. Move your mouse to the collection into which you wish to add your submission and click. Click on the "next" button to proceed. At the top of the submission pages you will find a progress bar with 7 oval buttons representing each step in the submission process. As you move through the process these ovals will change color. Once you have started you can also use these buttons to move back and forth within the submission process by clicking on them. You will not lose data by moving back and forth. At any point in the submission process you can stop and save your work for a later date by clicking on the "cancel/save" button at the bottom of the page. The data you have already entered will be stored until you come back to the submission, and you will be reminded on your "Submissions" page3 that you have a submission in process. If somehow you accidentally exit from the submit process, you can always resume from your "Submissions" page. You can also cancel your submission at any point. If you check any of the boxes on this page, you will be presented with a modified input form tailored to capture extra information. Otherwise you will get the "regular" input form. Multiple Titles - Sometimes an item has more than one title, perhaps an abbreviation, acronym, or a title in another language. If this is the case, and you want this information captured, click in the "yes" box. Published - New items that have NOT been previously published or distributed will be assigned an issue date by the system upon DSpace distribution. If you are entering older items that have already been distributed or published, click in the "yes" box. You will receive a form prompting you for several pieces of information relating to publication. Click on the "next" button to proceed, or "Save & Exit" button to stop and save or cancel your submission. The following two pages show you all of the relevant metadata fields for your submission. Most of the fields are optional. To discover which ones are mandatory, you can press “Next” to go to the next page. When mandatory fields are not filled out, they will be highlighted in red. Fields for which multiple occurrences are allowed, such as Authors or Conference, are enhanced with an “Add” button on the right. When you want to fill out an additional author, first provide the details of the first author and press “Add”. This will store the name of the first author and clear the text fields so you can provide the name of the second author. In order to remove provided information, check the box next to one of the provided values and press “Remove Selected”. Some fields are controlled by a specific vocabulary, such as the Conference and Corporate Author fields. A controlled vocabulary is a set of terms which form a dictionary of descriptions of particular types of content or subject matter. These are maintained by standards bodies in order to standardise the way that similar materials are categorised in archives. To enter a controlled vocabulary term in the form, select "Lookup" from underneath the input field. This will open a window containing the available vocabularies. 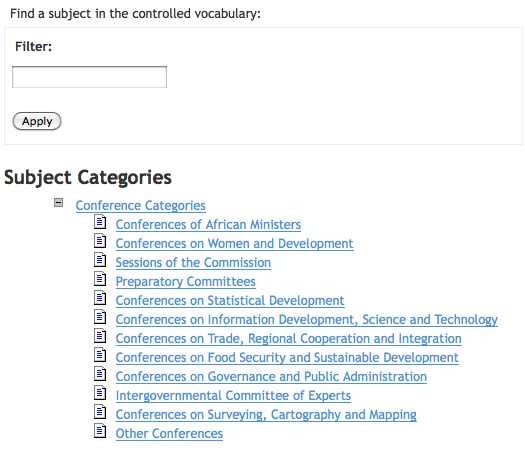 You may filter the vocabulary lists as described above in order to find the terms most relevant to your submission. Once you have found the term that you wish to enter, simply click on it, and it will be automatically entered into the submission form and the popup window will close. You may add as many subject category terms as you like into the form. Use "Add More" on the right to generate more input boxes. For these fields, you are required to select the appropriate value through the Lookup link and dialog. To select the appropriate value, click the subject category in the offered listing. After completing the metadata description of your item, you can attach one or multiple files corresponding with the provided metadata description. Click on the "browse" button and a window showing your files will appear. You can navigate through your directories and folders until you find the correct file to upload. Double-click on the file name you wish to upload, and the name will be entered into the input box. Along with your File, you can provide a File Description. These file descriptions are particularly useful when you are uploading multiple files for one item. The information you provide here will help users to understand what information is in each file, for instance, "main article" or "images" or "computer program" or "data set". If you're uploading more than one file, click on the "Upload file & add another" button . When you are satisfied that all files for this item have been successfully uploaded, click on the "Next" button. If you wish to verify the file using checksums, click "Show checksums" on the "Uploaded File" page. The DSpace-generated MD5 checksum for every file we've received from you will show to the right of the filename. You will then need to use a local program to generate your own checksum for these files, and verify that your results match ours. On most UNIX-like systems (including Mac OS X), use md5sum. For instance, type "md5sum MYFILE" for every file you want to check; the summary should print on your screen. For Windows machines, MD5 tools are freely available: try md5 (from http:// www.fourmilab.ch/md5/), or md5sum, available via the textutils package in Cygwin (http://www.cygwin.com/). All of these utilities will need to be run from a command-line, or terminal, window. The entire digest printed out when you run the md5 tool on your local copy of the file you're uploading should be exactly equal to what DSpace reports. This page lets you review the information you have entered to describe the item. To correct or edit information, click on the corresponding button on the lower left in each of the boxes, or use the oval buttons in the progress bar at the top of the page to move around the submission pages. Each of the boxes corresponds with one step in the submission process. Note that the very first property, the collection in which you are submitting your item can not be altered, although an administrator can change this for you after your submission was entered into the repository. When you are satisfied that the submission is in order, click on the "Next" button to continue. Click on the "Save & Exit" button to stop and save your data, or to cancel your submission. The repository requires agreement to this non-exclusive distribution license before your submission can be finalized. Please read the license carefully. If you have any questions, please contact an administrator. Now that your submission has been successfully entered into the repository, it will go through the workflow process designated for the collection to which you are submitting. Some collections may require the submission to go through editing or review steps, while others may immediately accept the submission. You will receive e-mail notification as soon as your item has become a part of the collection, or if for some reason there is a problem with your submission. If you have questions about the workflow procedures for a particular collection, please contact the community responsible for the collection directly. You can check on the status of your submission by going to the “Submissions” page under “My Account”.